The withdrawal of labour resulted in the suspension of bus, ferry and garbage collection services on Friday, with many workers attending the gathering to lend support to the protest. People gathered outside the BIU headquarters early in the morning, then marched to the House of Assembly, then marched to Cabinet, marched back to the House, then made their way back to the BIU building. Public services resumed again this morning, however protesters intend to gather again outside the Union again on Monday, which means service interruptions may occur again on Monday. You can follow all our live updates on the matter over the weekend and again on Monday here. 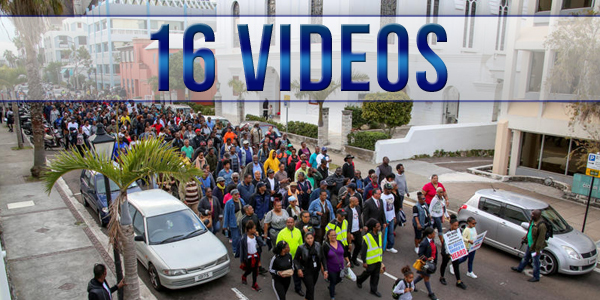 The sixteen videos below show various parts of the day including some speeches, marching, musical performance, the police escorting the Ministers through the crowd and more. Its unfortunate that it has come to this. I thought that the OBA were here to serve the People….Now I see OBA just wants to RULE the people…In the pictures and Videos all they do is walk by. They don’t care about the Bermudian People. Yes I would stop and chat..that’s the people that we elect into powers job..If they believe that the decision is so right and good for all Bermudians they should sit down and make it a bipartisan decision. what are they afraid of if they are so right? Of course the oba are devil cockroaches who just want the local Bermudians to hate them so they don’t get voted in. or I guess they might think they are doing the right thing? Spotty says the PLP and supporters are like Trump and his!! Xenophobic at best. wow you didn’t know THIS IS FOR THE CHILDREN, not kids(they are not goats) thats what we always do it for ALL of WE! Oh spare me please. Have you ever been to public school in Bermuda? It’s literally free nursery care. Even high school. The education afforded to public school students literally will not be good enough to propel 90% of students past the work force of Bermuda. The ones who are fortunate enough to study abroad find that the level of contrast to education here is very vast. I’m not anti school but just still salty over my experience lol. It’s funny. The oba like to refer to their supporters as “the Silent Majority” and Oba liken protestors to Trump supporters. Yet it’s Trump supporters that refer to themselves as the Silent Majority. The oba and those of their supporters who aren’t capable of seeing the agenda they are executing deserve EVERYTHING coming their way after Monday. What the oba is doing started with a lie, namely that they wouldn’t. And you all know that’s a fact. For a country that has one of the highest per capita churches on the planet Earth. I hope all the protesters go to church and think about how Jesus would think about the protest. Aren’t we all created equal. Stop the hypocrisy and double standards. Yeah Im sure Jesus would be all about an agenda designed to engineer the voting dynamics of this island. Recall, this is a plan they had from day one PER A PROVEN-TO-EXIST DOCTRINE. The oba has been executing their plan to secure power along lines since they were the ubp in 1998. This Pathways initiative didn’t start w “a look under the hood”. It started with a plan PERIOD. You people look so daft getting caught up in the oba’s flowery, colorful, albeit leaky, rationalizations. And what comes after Monday will be a natural, warranted response. expat why don’t you open a bible and read about jesus! This is about the ALMIGHTY MOST High! Your math is amazing. And it would probably take 32,501 folks to protest before the fact that the majority do not support this gets through your thick deluded heads. If you need recollection of the evidence which speaks to this start with the unprecedentedly large margin the oba lost by in the recent bye election. Not the majority at all. The BIU’s Chris Furbert had to give there members the day off to get a crowd. Very few are backing the the PLP and BIU cause we know there no good and they are taking the country for there own personal gains. Was that the same son of god who whipped the money changers out of the temple? who would he turn his whip on today? I can assure you the oba represents the interests of today’s foreign money changers first and foremost over those of the majority of this islands real bermudians. Perhaps on Monday they march to the biu to find out what the finances are like over there. Maybe we defer immigration until after the comi? just want to thank Bernews for the excellent coverage, enjoying the videos! Some of these protesters are so nasty and rude. How is spitting and pointing going to solve anything. Then I hear some of the protestors were making gun gestures, I guess you are trying to be intimidating. Can’t you see that the OBA is trying to move the country forward. It is so hard to try to do the right thing and be a good leader in this country. Some of you guys are such a nasty bunch! Let me tell you something, I’m going to give you the truth that God loves, if someone makes a gun gesture at me, they better mean it, pick the bones out of that one. I will show you what a house n….r is really about. We will see who would be the last man standing! Why cant we just get along, you lot want to spit at people! OBA, let me know if you need me to rally some of my comrades, we know what the art of war is really about. Then because you have someone like me who is disgusted with the way some of these protestors are going about their business which is what makes me upset, you will hear some say, “see what we mean, OBA got people on their side who are nasty ” that’s not it, if one is attacked for no reason whatsoever, shouldn’t be or she defend oneself! How is it right to treat any human being the way some of you nasty protestors have treated this government. This is sick…Just sad. 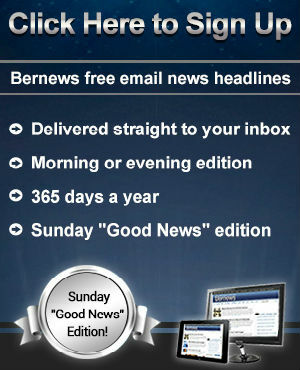 Good job Bernews! More videos so they can’t hide their faces. I read Mr Dunkley,s letter to Mr Chris Furbert, in which they wish to delay the Pathways to Status by 90 days for those on with more than 15 years, it also undertook to have Bermudians under-go training, and a few other propos als. The training idea is good, and much needed .. delaying implementation of Pathways to Status by 90 days puts us back to SQUARE ONE…which means simply that…a delay; not a change of heart. How many Bermudians properly trained will be ready in 90 days to fill positions currently held by guest workers ?